OMG. 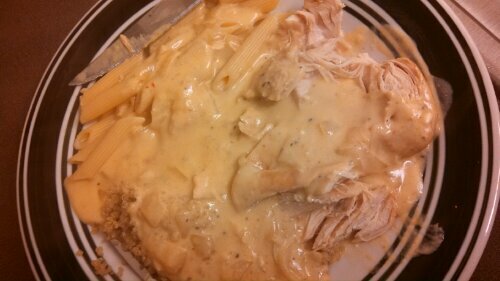 That really sums up this creamy, cheesy chicken by Crème de la Crumb (as also seen on food.com). I am not joking. My husband and I almost finished the entire crock, until we realized that we shouldn’t, and decided to portion out the leftovers into Tupperware for lunches. Yup. I feel like that willpower deserves a present of some sort. I accept cash and money orders! ;);) Kidding. We ate this a few days before Christmas Eve, while curled up on the couch watching Elf. It was a pretty great night, I must say. I used 3 chicken breasts for this, so I suppose it technically serves 3, but we were able to portion the leftovers into two tupperwares (I feel like I/others eat less at lunchtime than at dinnertime). 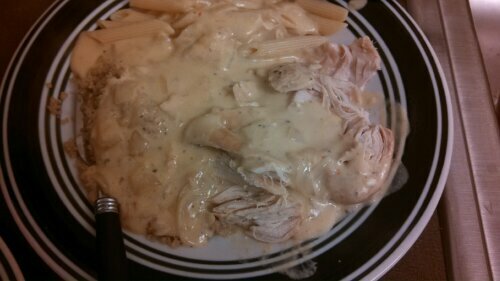 On the other hand, I lessened the chicken amount, but I didn’t lessen the other ingredients, which really helped contribute to the amazing creaminess of this. The original recipe says to cook for 4-6 hours on low, then add the other ingredients and cook for an additional one hour. Well, I didn’t have that kind of time. I cooked for about 2+ hours on high, about one hour on low, and then 45 minutes to one hour after adding the other ingredients. I think you can adjust it at your will, just make sure the chicken is actually cooked through! I had to omit the chicken broth, as I realized I didn’t have any, so I used water (in the can that had the cream of chicken soup), and I only used half of the cream cheese amount. Also, I paired it with leftover noodles and quinoa. Carb attack!! But it was oh-so worth it. I am sounding pretty pathetic right now, I think, so I’ll stop typing and just post the recipe! Oh…one more thing. If you’d like to venture out and make your own cream of chicken soup, there is a recipe for it on the original blogger’s website! -Place chicken in the crock pot and sprinkle the Italian seasoning and 2tbsp melted butter on top. -Cover and cook on low for 4-6 hours (see my notes above). 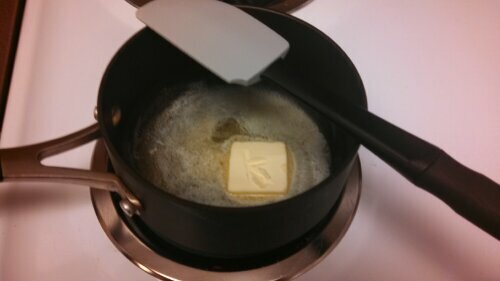 -Shortly before it’s ready, melt 2 tablespoons of butter in a saucepan, and sauté the onion and garlic. -Add the cream of chicken soup, cream cheese, and chicken broth/water. Stir or whisk until smooth and creamy. -Add the mixture to the crock pot, stir, and cook on low for one more hour. -Serve over pasta, rice, etc.